After a few days at the Tip, driven by hunger and thirst, just like the first explorers had been a hundred years earlier, we headed south to the bottle shop and supermarket in Bamaga. These were adequate establishments considering their location and reasonably well stocked. We bought a 2 litre wine cask (which is all you can buy up there, for inflated prices), refilled with the most expensive gas refills in the country, and fueled up at $1.90 for the drive back south. We were still sad to be leaving the tip, it was a nice area despite the roads, the scenery was good and the people were very friendly and we'd put is a heck of a lot of effort just to get there. But we'd seen all there was to see and done everything practical and it was hot. 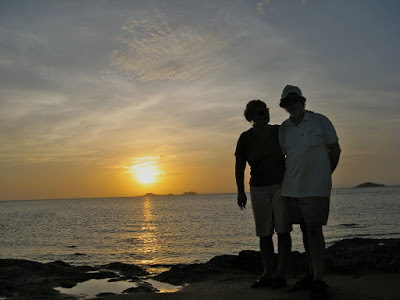 Our final sunset at Seisia Beach. 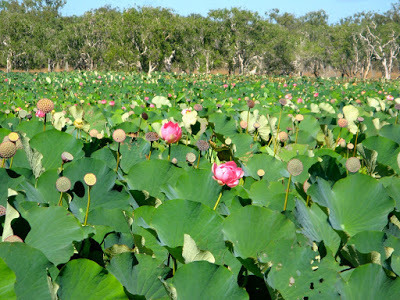 South of Bamaga is a pretty creek a few km off the main track. 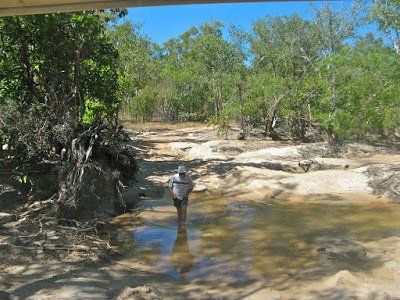 Called Jackey Jackey Creek, it's not the muddy crocodile infested river just east of Bamaga Airport, it's on the same creek but much further upstream in a rain forest. 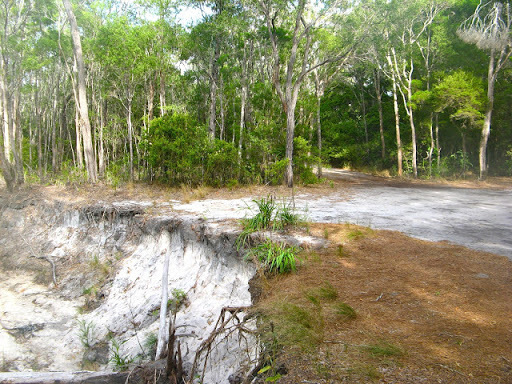 When we drove down a very narrow winding overgrown track to Jackey Jackey Creek, there was no one at the campsite. 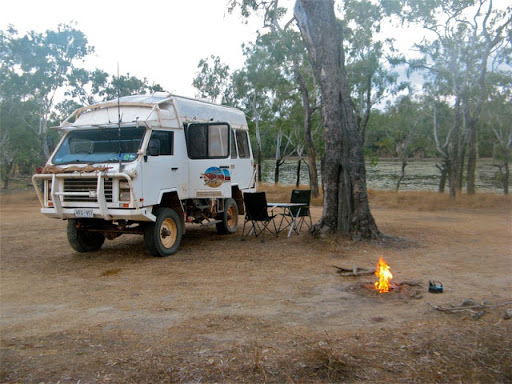 But just after dark, while we were having dinner in the warm still of the evening, a left hand drive Land Rover roared into view with all it's lights blazing and turned right into the campsite. We both jumped up and shouted and pointed the other way since "right" went straight over the edge of a dry creek bed about 3 meter's deep, which of course you can't see at night. "Right" into the campsite led over the edge of this creek bank. Impossible to see at night from the opposite entry point. The passengers, a girl and 2 guys, were Polish, on a 3 year round the world trip filming as they went. They immediately took all their clothes off and leapt into the creek. They had no air conditioning in their car (it's not needed in Poland) and they were very hot and sticky. Sadly I didn't photo that incident but we had a more leisurely wander in the creek earlier. Taking the waters at Jackey Jackey Creek. The Poles had very over-the-top personalities but were good fun, and they thought the Oka was wonderful after the cramped conditions in their Land Rover. 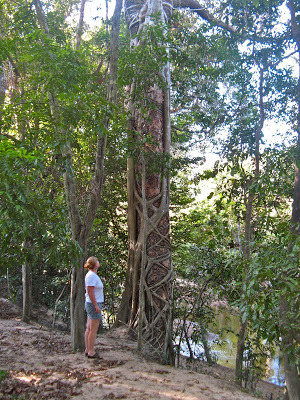 The next day, we checked out the track to Viryla Point but there is a log bridge that looked suspiciously tricky. Lighter, nimbler 4WD's were negotiating it, but very carefully, but we considered there was too much risk in the OKA slipping between the logs and getting the tyres irrecoverable wedged. Comparing it with photos from previous years, the logs had deteriorated further so we decided not to risk it. Anyway we were told the beach and camping areas were very crowded and our trip still had a long way to go. 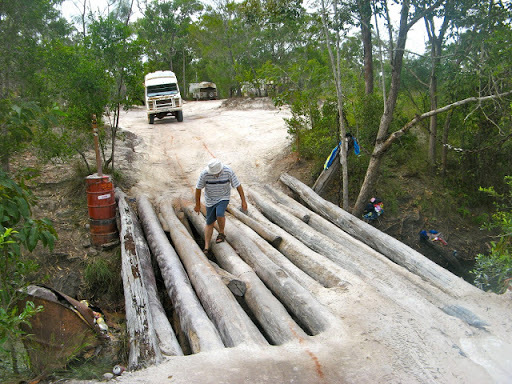 Dodgy log bridge on Crystal Creek on the road to Vrilya Point. We chose not to risk it. 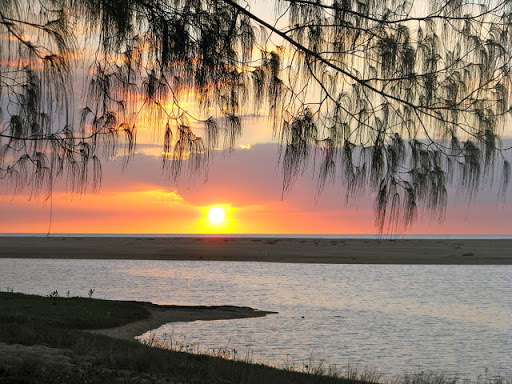 After about 2 weeks north of the Jardine, we dragged ourselves back over those awful roads to visit Weipa and some other coastal places we missed on the way up before heading west across to Normanton and Burketown and places west. Weipa is a large and well stocked town on the west coast of the Cape. We had to stay in the very average campground there as camping is not permitted anywhere else since the whole town area is all an active mine site. 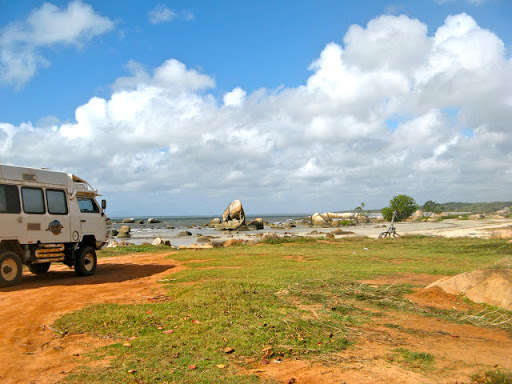 Next day we moved up to a beachside camp area in Mapoon, a small sleepy aboriginal township about 100 km north of Weipa on the west coast of the Cape. Mapoon beach 100 km north of Weipa. Mapoon has a somewhat shady past. In the 1950's the government of the day declared the whole are a mine site and gave it all over to Comalco. The people who were living there were forcibly removed to New Mapoon, which is near the tip of Cape York. To prevent them returning, the police were empowered to burn down their houses. It's hard to think of that sort of action happening today and many people are now returning to the area and the original Mapoon is starting to revive itself. Mapoon is a very pretty beachside community where fishing is their main occupation. The campground was reasonable and free and just by the beach. While there we found a recently fallen coconut which I cut in half with a saw (they are very hard). 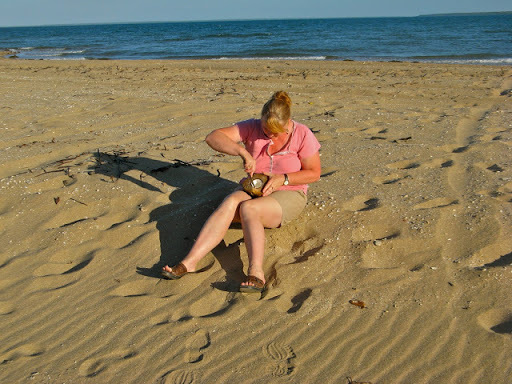 Janet sampled the juice which apparently was fine and then sat on the beach for an hour eating all the white fleshy part. 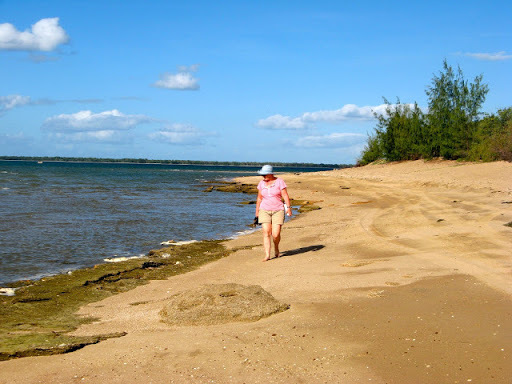 On the way down from Mapoon we spent 4 good days out of touch but on a beautiful beach 60km north of Weipa. It's on the banks of the Pennefather River on the west coast of the Cape, and no, we had never heard of it either. The track in started OK but quickly became a deep sandy track along beach sand dunes. We didn't get bogged but other people had. Obviously we had missed the plastic bag hanging in a tree which marked the correct track. The difficult beach track to the Pennefather River. 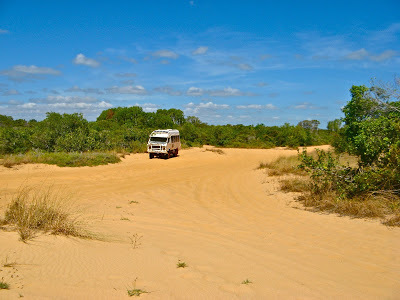 When we finally got there, after having to reverse 1/2 km up a sandy track since I couldn't turn around, (the sand was too deep and the front wheels stubbornly refused to move out of their tracks), the (free) campsite was superb under the shade of whistling sheoak trees with clear blue seas and sandbars to wander over. There was a tempting lagoon just in front of us teeming with fish, plus a resident crocodile so we couldn't swim. The sunsets however were spectacular. 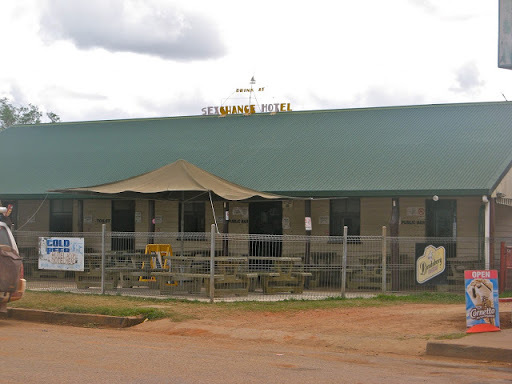 But we couldn't stand more than 4 days of lazing around with good company, even if they were Kiwis, (and we'd run out of grog) so we returned to Weipa for supplies (it's a well stocked town, the base for Comalco's Bauxite mine, the largest in the world) . 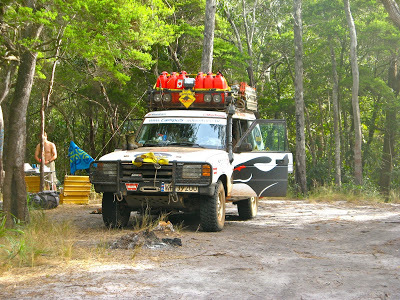 We took the correct track out from Pennefather this time, a pretty sandy track through a paperbark swamp. From there we spent the night on Merluna Station, run by the rellies of a lady we had met in Georgetown (their Aunty Janet, who ran the vegie shop). 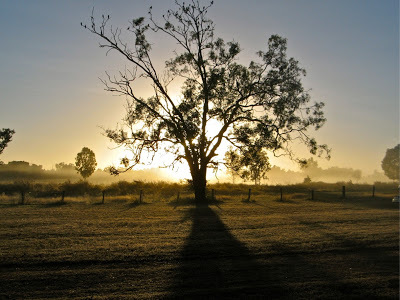 From a green and grassy campsite, we saw a beautiful misty morning as the sun rose the next day. Back on the main peninsular road we headed up the Portlands Roads road and camped alongside the Wenlock River before heading across the Cape to Chilli Beach. It's a totally different environment on the east coast. Windy, cloudy but with swaying palm trees all along the beach. We only stayed one night on Chilli Beach, it was just too windy, a persistent, howling wind which buffeted even our heavy Oka. Unfortunately the east coast is also ruined by plastic rubbish everywhere, mostly bottles, thongs, fish nets and rope. Presumably it's brought in by the tides and SE Trade Winds which blow continually at this time of year. It completely spoils this side of the Cape. Fortunately the local residents had organised a clean up day, but for the week after we had left. Janet on a very windy Chilli Beach. There is a superb area of rain forest here in the Iron Range National Park which comes right down to the beach, so thick you couldn't walk though it. We'll go visit that while we are here, also Portland Roads community which was a WW11 US Navy supply base just up the coast. Well Portland Roads was a very pleasant surprise. Unlike other east coast areas, this is nestled in a sheltered cove and was calm and peaceful. 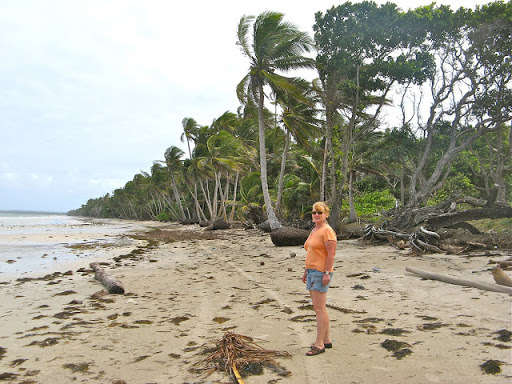 It's an idilic spot with a small beach surrounded by palm trees and flowering bushes. 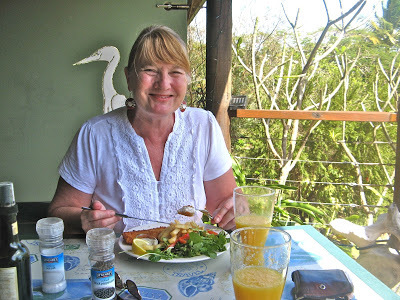 Although there are no camping facilities, and no shops either, there is a marvellous cafe set part way up a hillside which serves the most delicious and inexpensive meals in lush surroundings. We had been told they served the best fish and chips in the country and we were a bit sceptical. However, they were right and we enjoyed beautifully pan fried spangled emperor, served with lightly fried chips and fresh green salad for only $20 each, with freshly squeezed orange juice. Delicious. Janet enjoying Spangled Emperor, salad and chips. 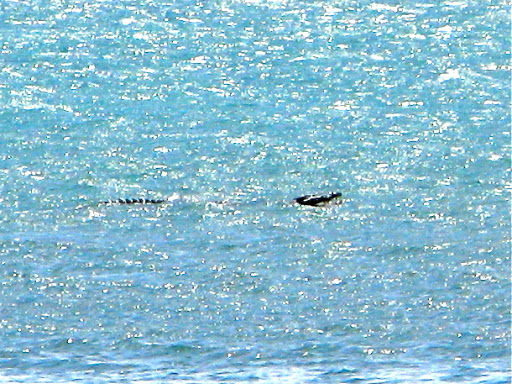 And as an added treat we spotted a large crocodile swimming lazily across the bay with it's jaws open. It too was very laid back, in keeping with the rest of the small community. Huge croc swimming lazily across Portland Roads bay. South of Chilli Beach is the Aboriginal community of Lockhart River. This is an open community which welcomes visitors and has a very nice beach nearby, Quintel Beach. 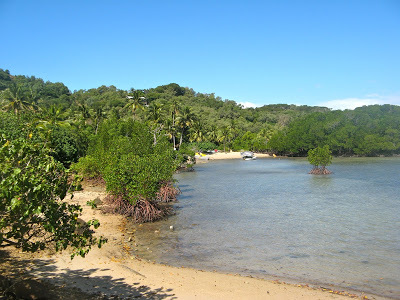 Quintel Beach at Lockhart River. 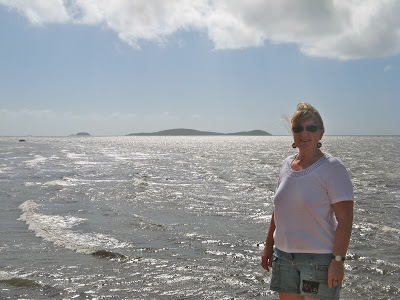 We had lunch there and Janet posed in front of Lloyd Island since her maiden name was Lloyd. Janet (neé Lloyd) in front of Lloyd Island. When last we spoke we were in Coen, just about to visit Lakefield National Park. While having lunch we spotted a "dog poo" tree. It was actually a bean tree with bean pods which looked just like, well, the aforementioned doggy doo. Nearby is an interestingly renamed hotel. The SEXCHANGE HOTEL at Coen. We did the Lakefield National Park and enjoyed the lilly covered lagoons, birdlife and the corrugated roads, there being no other kind. There are some very nice spots there and we had some great campfires. 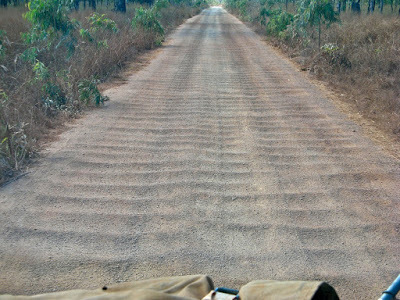 Corrugated road through Lakefield National Park. 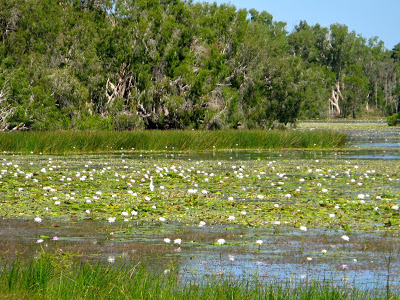 ...and the White Lilly Lagoon. 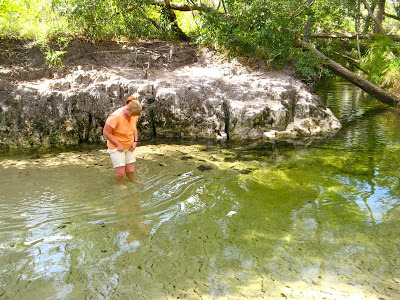 Some lagoons were still inaccessible due to the late wet season rains. This was a deep soggy sandy crossing that we chose not to risk. 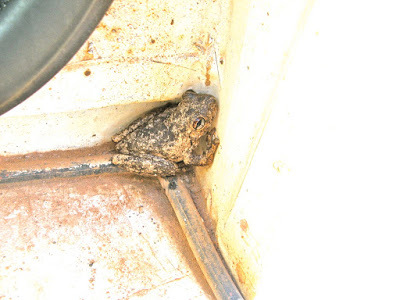 One morning at the Hann River Crossing I found a frog which had taken up residence in the frame of the Oka passenger door. I called Janet out to have a look but she was just out of the shower. "No matter" I said, "it's quite warm", so she took a couple of steps outside, but at that exact same moment the only people we had seen in 2 days just happened to walk by. Janet shrieked, unnecessarily I thought, and rushed back inside to hide her embarrassment. It was still a nice looking frog though and definitely not a "Tane Coad". Janet's frog in the door frame of the Oka. 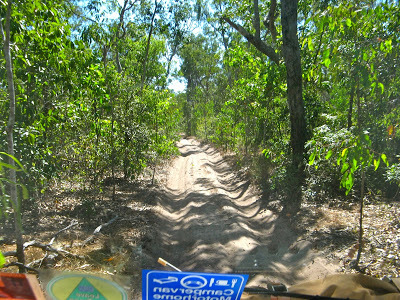 The roads are pretty rough on Cape York. 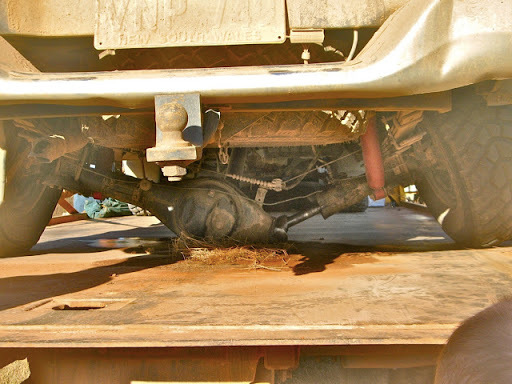 This Toyota Hilux has bent its axle just a bit. Bent axle. Look at the wheel, not the legs. Close up of the axle, not the legs. Sorry.